Today is Darwin Day (February 12), a day to celebrate scientific ingenuity and bravery. Charles Darwin was just one of many scientists who strove to change the way people think about the world. Charles Robert Darwin, (February 12, 1809 – April 19, 1882) was an English biologist, naturalist and geologist. He was best known for his theory establishing that all species of life have descended over time from common ancestors. He published his finding on the theory of evolution with a great deal of compelling evidence in his book On the Origin of Species (1859). He was truly a fascinating scientist. Here are some tips to help you kick off your own Darwin Day celebration! There is a wealth of information about Darwin and evolution at the Darwin Day website. You can learn about Darwin’s life, as well as find links to many different websites and documentaries to learn more. What better time to begin using the Build Your Library Darwin and Evolution unit study! 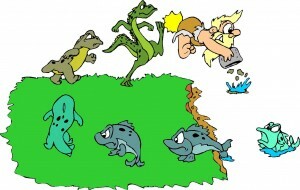 Teach your child all about the Theory of Evolution, as well as the origin of the Earth and the life of Charles Darwin. In this comprehensive, multi-age unit study, I have scheduled 8 books to help you explain these ideas to your children. They will create a huge Timeline of Life, journey around the globe with Darwin on the HMS Beagle, become a naturalist and study the world around them, learn about fossils and make their own, and much more. While this study is best suited for children in 4th – 8th grade, I have scheduled several books for younger students and many of the activities are easily adapted for younger children. One Beetle Too Many: The Extraordinary Adventures of Charles Darwin – This is a great introduction for younger elementary aged children to learn about the life of Charles Darwin. They’ve just released a paperback version for a very good price, but if you can splurge and get the hardcover, the illustrations are worth it (recommended in our BYL Darwin and Evolution unit study). Evolution: How We and All Living Things Came to Be – This book is a fantastic resource for explaining Evolution to children (scheduled in our BYL Darwin and Evolution unit study). The True Adventures of Charley Darwin – This historical fiction novel is a great book for those wanting a little more story to their history. Follow Charlie from his childhood in a boarding school for boys to his adventures at sea on The Beagle where he first began to realize his theory on natural selection and evolution (scheduled in BYL Level 8). The Evolution of Calpurnia Tate – I adore this book. Calpurnia lives at the turn of the century in Fentress, TX, and is the only girl in a family with 7 brothers. She befriends her grandfather and decides to become a scientist. This book is hilarious, sweet and heartwarming (scheduled in our BYL Darwin and Evolution unit study and BYL Level 6). The Curious World of Calpurnia Tate – The sequel to Evolution of Calpurnia Tate, this book picks up just a few months after the events of the first book. There is a lot of information about veterinary science, as well as the Galveston flood. Our Family Tree: An Evolution Story – This is a perfect introduction to evolution for very young children. It’s beautifully illustrated, and makes a lovely bedtime story. Grandmother Fish: A Child’s First Book of Evolution – This is another fantastic introduction to evolution for very young children. It’s a great way to introduce your preschooler to the origins of life on earth. Annabelle & Aiden: The Story of Life – The Annabelle & Aiden books are gorgeous picture books and this one is a particular favorite of my youngest. Told in rhyming prose, this book explores the origins of life on Earth, and answers a child’s simple questions about where we came from and why we look the way we do. How do you plan on celebrating Darwin Day in your homeschool?